Giselle was born in July 2012 and everything went smoothly. Her parents were excited to have a happy and seemingly healthy little girl. As a toddler when she began walking, they noticed something wasn’t right. She seemed unstable and her doctor suggested they take her to Doernbecher Children’s Hospital in Portland for an evaluation. Before they could go to that appointment, Giselle had a major seizure. They soon realized she was having all types of seizures, including drop-attack seizures… more than 50 a day! Giselle became incapacitated. She was put on many medications, but nothing seemed to work and help with the constant seizures. Doctors did many tests, MRIs, bloodwork, and a spinal tap. She was finally diagnosed with Progressive Myclonic Epilepsy. 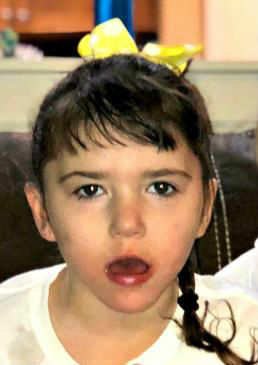 This type of epilepsy is very rare, and Giselle is one of only 6 children in the United States diagnosed with it. Giselle has developmental challenges and she has stayed at the level of a 12 to18-month-old child. Giselle can no longer walk and spends most of her time in a wheel chair. She is also non-verbal, battles frequent illnesses, has sleep issues, battles 4 to 5 different types of seizures, and eats through a tube in her stomach to make sure she gets enough nutrition (because she can’t chew her food). The family makes trips to Portland every 3 months to visit her specialist. In January 2018 Giselle was hospitalized again and her family learned about how the Ketogenic Diet could help with her seizures. Giselle’s mom began blending the right combinations of foods that seemed to help control her constant seizures. Her mom prepares and blends just the right amount of ingredients that have started giving Giselle more energy and alertness. She says it’s like “food science”, and it’s working! Giselle loves anything to do with Mickey Mouse! She will instantly perk up when she sees a Mickey Mouse toy or video. She also enjoys playing in any kind of water whether it’s a pool, bathtub, or at the beach. She also loves the sand and enjoys watching and hearing the ocean waves. Giselle has been through so much in her 6 years of life. Her family is grateful to have the support of the students through Barnes Butte’s Sparrow Club Project! Sparrow Cash raised for Giselle will help with ongoing medical expenses, special equipment and everyday living expenses. Students at Barnes Butte Elementary will “earn” Sparrow Cash by completing a minimum of 256 hours of sponsored community service.